There is a subtle distancing effect which our numerous online devices and other technologies foist upon our minds regarding the world of everyday objects. Left unchecked, we develop a disregard and disinterest in things and their nature, reflected in the disposable stance many ‘movers and shakers’ adopt towards articles of utility. But imagine if the surrounding world of objects could be reunited with their rightful depths of significance, qualities, and history! Suppose you had to think ONLY about a piece of chalk, to take a mundane example, for 10 full minutes. How difficult would it be, and what could be recovered? 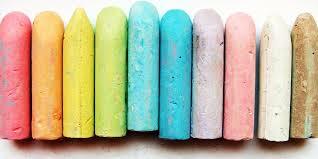 A piece of chalk is a writing/drawing implement which is between 3 and 4 inches long and about 1/3 of an inch wide. It is a very smooth bright white cylinder. The curved long surface is hard and precisely formed while the circular ends appear softer and may contain little dents and nicks. It is very light and easy to grip with the hand. Chalk is normally available as a box of 12 sticks and quite affordable, one being able to purchase a box online from Amazon, for example, for less than one dollar. Chalk, a type of limestone, consists mostly of the mineral calcium carbonate, (CaCO3), which occurs in nature as a sedimentary, soft, bright white, mineral deposit. The origins of these deposits are closely connected with ancient sea beds, and the minerals themselves arise from the desicated remains of billions of extremely small sea creatures, called plankton. A very well-known and exposed chalk deposit form the sea-cliffs of part of the southeastern edge of Great Britain, known as the white cliffs of Dover. Another famous deposit lies in the Negev desert in Israel. There are also extensive underground chalk deposits throughout the European mainland, and elsewhere in the world. These subterranean chalk deposits give evidence for the previous existence of an ocean floor in what is now central Europe, long since buried by geological activity. In any case, the raw chalk deposits are plentiful and easily accessed, whether directly or by employing explosion mining. The soft rock is extracted with comparatively minimal labor. The manufacturing process for chalk is large-scale, highly automated, and efficient, although cottage industry variants exist in 3rd-world locales such as rural Africa and India, employing roughly the same techniques with cheaper tools and a small scale approach. The modern process is as follows: first, large blocks of the mineral deposits are broken off and either transported to the manufacturing facility or processed on site. The large chunks are sized roughly the same so they can be placed into an enormous metallic crushing chamber, the interior of which contains variously shaped protrusions and metal balls. The crushing chamber is rotated for several hours until the result is a fairly uniform collection of much smaller blocks of chalk. This process is then repeated with a series of several smaller and faster tumbling chambers, the result being smaller and smaller pieces of chalk. The final chamber accepts pebble-sized pieces of chalk and converts them into a coarse powder. This result is then filtered and sieved to remove unwanted harder minerals and things like bits of seashell. The next step is to make a warm slurry. The chalk powder is placed into a large bath with water, liquified clay as a binding agent, and optionally, powdered dye. 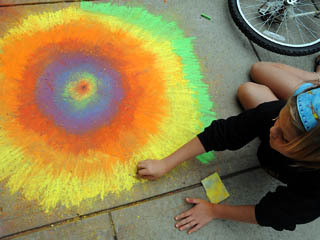 Chalk is most commonly white, but other colors also occur: yellow, orange, blues and greens, and a bright pink. If the chalk is destined for educational use, these ingredients suffice. But a second type of chalk is used more for artistic and recreational purposes, normally outdoors. This type of chalk is softer, has a higher water content, is thicker (about one inch in diameter), and perhaps one inch longer. Plus it comes in a wider variety of colors, hence dyes. A calcium sulfate powder, (CaSO4), is added to the slurry for this kind of chalk. The slurry is stirred and blended for several hours while gradually thickening. At the right point it is then extruded out through precision cast dyes into the shape of long cylindrical rods, about one meter in length. These rods are arranged in a series of parallel trays and placed into ovens for cooking and solidifying, another hours-long process. The school chalk sticks are cooked longer than the artistic chalk, and hence are drier. When done, the rods are cut into usable lengths. Each rod will make 10 or so pieces of chalk, about enough for one typical box. The boxes are distributed through online shopping or in bulk to educational supply houses or to stationery office supply shops and art supply shops. The recreational chalk is often packaged in transparent pails containing 24, 36, or 48 pieces of chalk in varied colors. Chalk works by virtue of being dragged along a harder, ideally smooth, surface. An actual trail of the chalk’s own substance is left behind as a result of this action, forming visible line segments and curves. One can control and vary the displayed markings by altering the pressure and angle which the chalk makes with the writing surface, causing thicker or thinner and brighter or dimmer marks. One can also hold the entire piece of chalk flush or perpendicular to the writing surface and by rubbing form a colored area. The usual surface, a chalkboard, is itself composed of a sedimentary rock: slate, adhered onto a glass core, forming a large uniformly flat drawing surface. Chalkboards are often a dull black color, but also a dark green or tan, in order to maximally display the contrast between the marked and unmarked parts of the chalkboard, affording visibility from any point in a school classroom. Chalk is instinctively easy to use. Young children use it in the earliest school grades to learn how to write the alphabet. The chalk is responsive and natural to control. It can also be used to draw with; colored areas and shapes can be formed. Because the chalk markings are merely deposits of the chalk’s own soft substance, it is quite easy to modify what has been written or drawn. A finger or side of the hand may be used to remove sections of lines or alter thicknesses of curves, with the removed markings collecting onto the skin from where they can easily be rubbed off. One can also use erasers, strips of thick dark grey felt sewn together in parallel and fastened to a block of wood which fits into the palm of the hand. An eraser can be used for fine adjustments, using the corners to rub away small portions of what has been drawn by the chalk; or it can be used for bulk removals of large swaths of marked chalkboard by pressing it flush to the board and wiping with large arm motions. Erasing is not a completely effective process. It leaves a dim cloudy area of mostly removed chalk. With repeated fillings of the chalkboard and erasures to reclaim space, the cloudy residue becomes thicker and more visible, reducing the contrast between the dusty chalkboard and fresh markings. 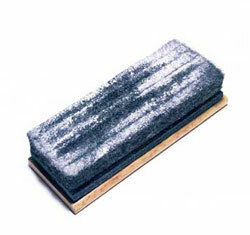 The erasers themselves also become less efficient because their felt collects more and more chalk substance. This situation demands that the chalkboards be cleaned with a sponge and warm water, and also that the erasers be cleaned, normally by clapping two of them firmly together or against the wall of a building. This is best done outdoors because a dust cloud of powdered chalk will be released. Decades ago chalk dust used to be more intrusive and could affect breathing in sensitive people, but modern chalk is advertised as “non-toxic” and will not make very significant dust clouds (due to more extensive heating during manufacturing which eliminates moisture). After the chalkboard has been washed it needs to dry for about 15 minutes before new chalk markings will adhere to it well enough to be legible. Water is the enemy of all sedimentary minerals like chalk deposits, as attested by it’s erosive and shaping qualities geologically. This is also why outdoor chalk drawings are temporary; rain will soon erase them. Chalk in it’s present form was developed in the late 1700s, in several places more or less simultaneously. Known since antiquity as an effective marking implement, it’s presence has been confirmed by archaeologists within famous cave paintings in France. By the 1600s, artists were drawing with rough-hewn sticks of colored chalk. 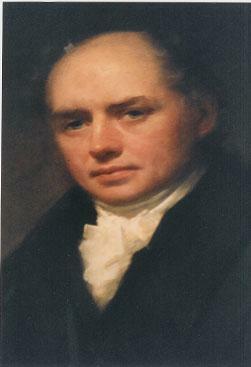 James Pillans, a Scottish geography teacher, first came up with the innovation of hanging an enormous black slate in front of his classroom. George Baron, an instructor at West Point Military Academy, is considered the first American to adopt the use of a large black chalk board for presenting his math lessons in 1801. 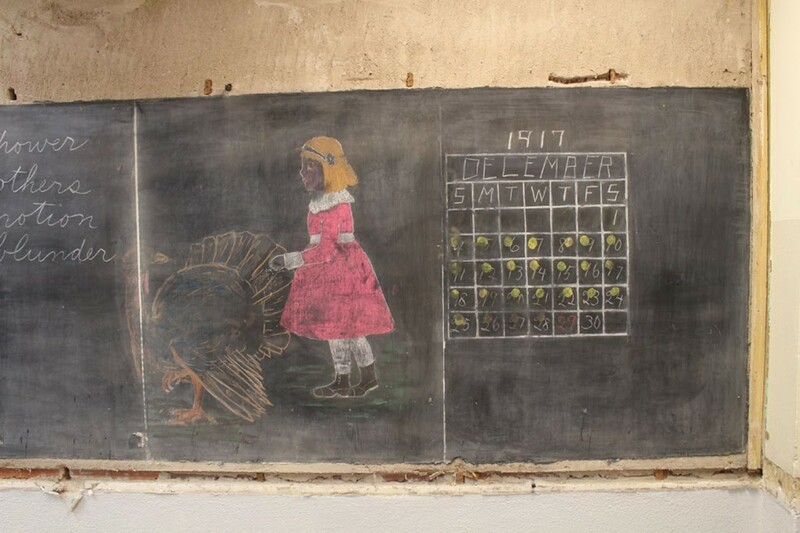 Before chalksticks and classroom boards were popularized, it was common for students to carry about their own personal school slates for lessons and irregularly shaped chunks of chalk. The slates were heavy, unwieldy, and often quite irregular, while the chalk was unrefined, and sleeves often served as erasers. Writing lessons and cleaning the slates was quite a different undertaking then. Further, teachers often had to visit each child and draw lessons upon their slates. 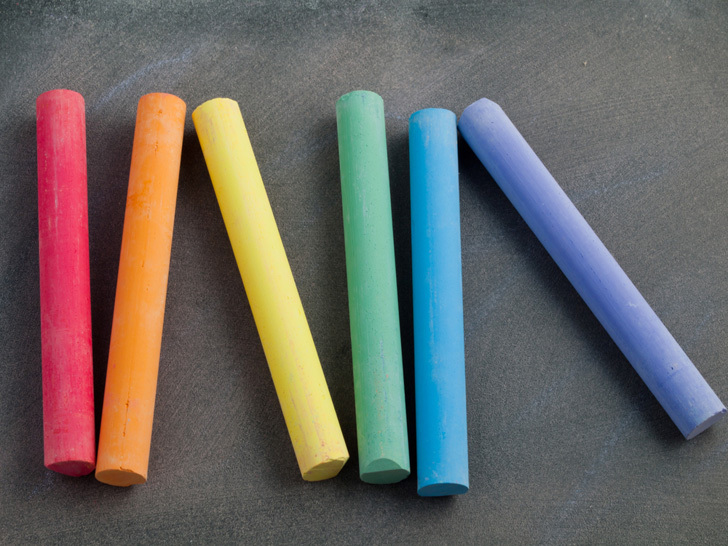 Chalk enjoys extremely widespread use within an educational context nowadays. 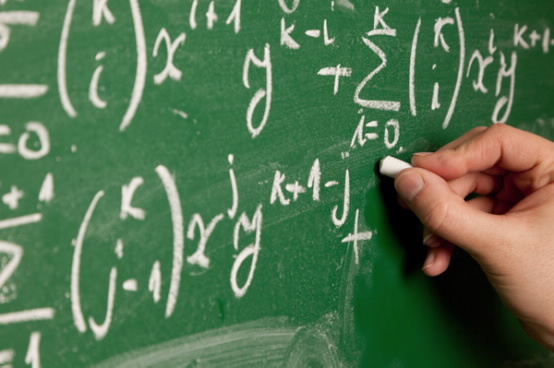 Its usage has spread to every country in the world and most schools utilize chalkboards for lessons and teaching at all grade levels, including universities. Considering how many of the earth’s residents are of student age and estimating that each student might use one box of 12 chalk sticks per academic year, plus adding in the amount used by teachers, you can easily imagine that world chalk consumption, just for schools, might approach 100 billion pieces per year. In addition, there is the recreational and artistic chalk used by children on their driveways and sidewalks or playgrounds, or artists on public plazas. Responsive and flexible artistic chalk, the sulphur-based kinds, are used by skillful artists to achieve large and wonderful effects. Many of these works are trompe de l’oeil style drawings with great realism. Tailors traditionally use a thin triangular type of chalk while marking and measuring their fabrics. Types of chalk are also used in construction work for buildings and roads, as well as in sports activities to mark boundaries. The outlook for chalk as an article of utility is good. It is cheap and widely in use. There is no shortage of the raw materials worldwide and the manufacturing and distribution processes are well understood, highly developed, and relatively inexpensive. It is difficult to improve upon chalk while still retaining the quality, ease of use, effectiveness, environmental safety, social availability, and affordability. The fact that the manufacturing process has expanded into third world cottage industries supports this as well. Some classrooms and many corporations have converted to whiteboards and colored felt markers, or electronic digital viewers, but there are downsides which prevent wholesale conversion away from chalk and chalkboards. These include greater difficulties in keeping whiteboards clean, the presence of less safe and smelly chemicals in the markers, the more invasive nature of colored marker dust, the inability to determine when a marker will dry out, the need to remember to cap the markers to avoid their drying out, and the added expense barrier. Chalk can be seen as a culturally successful instance of a more generalized and ancient discovery, namely using a softer sedimentary rock or mineral to make markings upon a harder surface or rock. Typical childhood play experiences bear this out, as many of us have picked up various stones of differing colors and made marks with them upon harder surfaces, like sides of buildings, sidewalks, and other rocks. The principle is always that the softer drawing stone leaves behind a portion of it’s own substance as a colored trail on the harder substance. Stones with iron deposits often produce brown or reddish marks. Some stones produce bright silvery marks. Chips of brick or charcoal are other examples which children often discover and doodle with. Note: This piece attempts to exemplify the thought content of a meditative exercise, ideally repeated daily, called “Control of Thinking”. The idea of this exercise is to deliberately control and sequence one’s thoughts about a chosen simple object, a piece of chalk in this case, for a period of 5 or 10 minutes, while allowing no concentration lapses or mental wandering. What matters is that only thoughts specifically chosen and logically ordered are allowed to exist in one’s mind for the duration of the exercise. Factual accuracy is desirable, but not the focus, although the exercise does create a deeper than usual interest in the nature of everyday objects and how they become so — which leads to research. Try it sometime — definitely not as easy as first imagined. To learn more about this meditative technique, read here, or watch here.